What Does It Mean To Worship In Spirit And Truth? On most Christian radio stations today you can find just about any kind of worship music. Likewise, in most churches you can find the same. There are even college degrees offered in worship arts from a number of colleges. 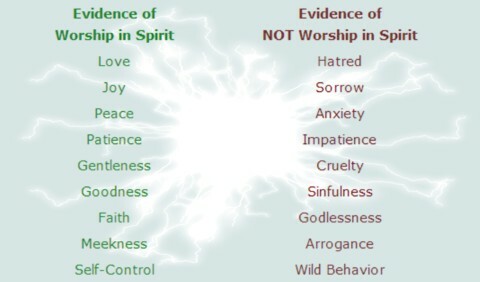 With all of these approaches to worship, a common description people use to describe worship is that it should be in Spirit and truth. What most people wonder is what does it mean to worship in Spirit and truth? What does it mean to worship? Worship is commonly defined as follows (1): Noun- 1. The feeling or expression of reverence and adoration for a deity. 2. Adoration or devotion comparable to religious homage, shown toward a person or principle. Verb- 1. Show reverence and adoration for (a deity); honor with religious rites. 2. Treat (someone or something) with the reverence and adoration appropriate to a deity 3. Take part in a religious ceremony. What is the foundation of proper worship? A proper foundation of our worship depends on our motivation. If we are motivated by what appeals solely to our lustful desires (1 John 2:15-16), then our worship will not be pleasing to God. However, if our worship is based on our love for God because of what He did by sending His Son Jesus to die on the cross for our sins, it is pleasing to Him (Isaiah 56:6-7; 2 Corinthians 5:5-9). With the proper foundation, we can then focus on what it means to worship in Spirit and in truth. Where does the phrase worship in Spirit and in truth come from? The phrase worship in Spirit and truth comes from a passage a Scripture found in John 4 when Jesus was traveling though Samaria and he stopped at a well. While there Jesus had a conversation with a Samaritan woman about worship. During the conversation, Jesus told the woman that the hour was coming when they no longer would worship in Samaria or in Jerusalem and that they did not know what they worship because salvation is of the Jews. Jesus then said to her, “But the hour cometh, and now is, when the true worshippers shall worship the Father in spirit and in truth: for the Father seeketh such to worship him. God is a Spirit: and they that worship him must worship him in spirit and in truth” (John 4:23-24). After this conversation, the Samaritan woman learned that Jesus was the Messiah and immediately left to go share the good news with others. This resulted in many more being saved as the word spread that the Messiah had arrived (John 4:25-42). To this woman, worshiping in Spirt and in truth took on a whole new meaning. Worshiping in Spirit means that our practice of worship should be produced by God the Holy Spirit. Evidence of this would be a worship practice that reflects the fruit of the Spirit as found in Galatians 5:22-23. Does our worship reflect love, joy, peace, patience, gentleness, goodness, faith, meekness, and self-control? Or does it produce hatred, sorrow, anxiety, impatience, cruelty, sinfulness, godlessness, arrogance, and wild behavior? If it reflects the first list that begins with love, then it is worshiping in Spirit. What does it mean to worship in truth? Worshiping in truth means that our practice of worship should reflect proper Biblical doctrine (Psalms 71:22-24; 2 Timothy 3:16-17; Ephesians 4:17-25). Evidence of this would be avoiding worship practices that God condemns theologically (Deuteronomy 18:9-14; 1 Corinthians 10:20). It also requires that the lyrics and even the writers of music used should be examined theologically. This is to ensure that the truth is being told lyrically, preventing possible endorsement of persons or organizations that are not doctrinally correct (Romans 16:17-18). If we take the time to examine our worship practices theologically, then it is worshiping in truth or according to the teachings of God’s Word. Worshiping in Spirit and in truth is more than just a slick phrase to put a stamp of approval on how we worship. It literally means that our practices of worship are examined to see what sort it is (1 Corinthians 3:11-14). If it is examined and found to be reflective of the fruit of the Spirit and produced by the Spirit, then it is Spiritually correct. If our worship includes elements that are examined and found to be doctrinally correct it means that our worship practices are in truth. In the end, worship in Spirit and in truth motivated by love is pleasing to God and edifying to the body of Christ. I teach special ed. What does God say concerning students with special needs and what should be my Godly perspective. Thank you Mr. Howard. All of us are created in God’s image (Gen 1:27) so we should treat all people with respect and dignity, no matter what disabilities they have. God created them for specific purposes so they should be loved, treated with kindness, and as if it were Jesus Christ Himself (Matt 25:40). Thank you for your comment sir. Is this our spirit or God’s Spirit? Jesus’s memorable statement in John 3:6 helps: “That which is born of the flesh is flesh, and that which is born of the Spirit is spirit.” It’s not either-or, but both-and. For those who are new creatures in Christ, our spirit owes its existence and vibrancy to the Spirit of God. As John Piper writes, “True worship comes only from spirits made alive and sensitive by the quickening of the Spirit of God” (Desiring God, 82). God’s Spirit ignites and energizes our spirit.